West Midlands based technical solutions specialist Central Presentations Ltd (CPL) has been appointed as the preferred technical supplier for Stoneleigh Events. Stoneleigh Events’ venue, Stoneleigh Park, is set in Warwickshire countryside just 30 minutes outside the commercial hub of Birmingham and also in close proximity to CPL’s HQ. CPL will be offering all the sound, lighting, video and AV equipment, and technical support required for corporate and live events, plus exhibitions. CPL’s Richard Burrow project managed CPL’s showcase at a special open day at Stoneleigh to demonstrate the range of products and services the company offers to potential and key clients. For this, a custom 14-metre wide set was installed in the venue’s Warwick Hall, complete with a 10ft by 5.7ft central projection screen. In addition, the set was wrapped in white canvas and the entire area pixel mapped using a combination of Mad Mapper and VDMX software to maximize the video projections. 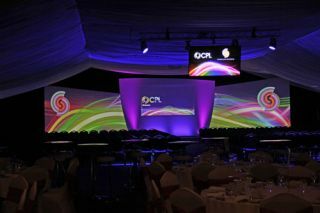 The CPL and Stoneleigh Events’ logos were animated using the same software to move with color changing light trails. Two Panasonic PT-DZ110 10K projectors were supplied for projection mapping and a Panasonic PT-DZ770 for the centre screen, together with one of CPL’s ‘fly-away’ PPUs, based around the Panasonic AVHS410 mixer, as well as an HD camera. This illustrated a live relay set up. For relay screens, the new Samsung ME55B plasma screens were utilized and, for an added visual dimension, a Samsung 75 inch ME75B LED Screen was centrally flown in the room displaying the Stoneleigh Events and CPL logos, to demonstrate how a screen of the above dimensions can create maximum impact for branding.